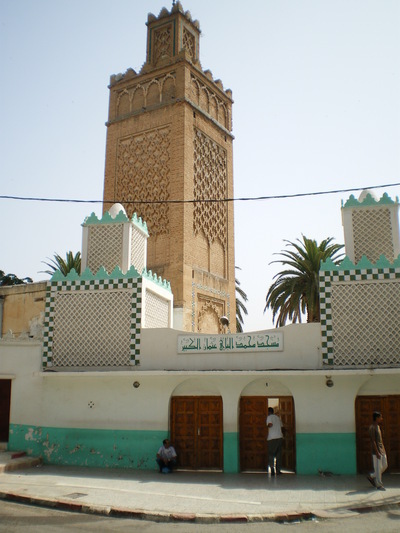 The 19th c. CE Imam Sidi Al-Houari Mosque, Oran -- Photograph 2010 Via Wikimedia Commons. ORAN, ALGERIA - A cool evening breeze brings relief over the faded glory of the city I am visiting. This was once the prized French metropolis on the Mediterranean that Albert Camus made the setting of his novel, The Plague. The crowd is gone and the street is about empty. But inside the cafe where I am sitting, there is smoke, loud arguments and anticipation as people await the games of Euro 2012 to begin. Algeria is a soccer-crazy country, as is all of North Africa. In the cafe the noise is friendly while individuals share with each other the game's history, relish arguments over previous tournaments, recall earlier matches, and talk about their favourite players from the past, comparing them with performances of the current stars, such as Spain's Fernando Torres or Portugal's Cristiano Ronaldo. The scene around me is not unusual, for soccer is a main topic of conversation wherever people gather. But the passion for it is also a measure of the general disdain for politics. Algeria is close to Tunisia — the ground zero of the so-called Arab Spring — and it is instructive to draw upon its recent history to understand why the expectations of a year ago for democratic change across the region peaked and then headed for a crash. In July, Algeria will mark the 50th anniversary of its blood-soaked independence from France in 1962, but there is little public evidence of preparation to celebrate the occasion. Algerian memory of the past half-century is painful. Authoritarianism and one-party rule following independence suffocated the promise of freedom. Some 20 years ago, the country's ruling elite and the National Liberation Front (FLN), its political arm, decided to arrange a transition to some sort of democratic order and called an election. But to the consternation of the army generals, the opposition parties headed by the Islamic Salvation Front (FIS) won big. Islamist leadership of the FIS enjoyed Saudi support, and the prospect of FIS turning Algeria into a Shariah-based Islamic order was as likely then as has been in recent months the Muslim Brotherhood's plans for doing the same in Egypt. The result of the Algerian election, not unlike the current situation in Egypt, was a crisis for the old order. The military elite, unwilling to accept the idea of the FIS forming a government, nullified the election and precipitated a civil war. Two decades later, and some quarter-million of Algerians dead as a result of Islamist terror and the army's counter-terror, Algeria's self-inflicted wound has barely healed. In May this year, the ruling authority held parliamentary elections in which the public turnout was merely 40% of the eligible voters. The authorities announced a modest FLN victory with a plurality of elected members, instead of fixing results by giving it a majority. It has taken time and violence for a consensus to emerge regarding the military having a dominant role in any political arrangement, and that is the political reality given the nature of Arab-Muslim culture. A majority of Algerians now reluctantly concede the alternative of FIS in power might have been worse, and is positively relieved of being spared the illusions of Arab Spring.